Try this new motivational strategy next time you’re stuck in an unproductive day from writing hell. Want a rush? Try this little motivational strategy I just stumbled upon. I was having one of those really productive days where I had so much I wanted to do I ended up taking a nap instead. I needed to do a read-through of my current novel draft, but I was SO sick of looking at it on my computer screen. I considered printing it out, but my printer can’t handle such a large job. And I wasn’t in the mood for an expensive trip to the library printer. So yeah, I took a nap. I woke up groggy and continued to accomplish nothing for the rest of the afternoon while I watched cruddy daytime television and the minutes crawling by on the wall clock. My kids were going to return from school soon. After 3:00, my chances of accomplishing anything for the day would drop to around 0%. Then I got an idea. Why not PDF my file and read it on my phone? It’s not ideal. A Kindle screen would likely be easier to read, but I can’t afford a Kindle. The free Kindle app on my SmartPhone is about as good as it gets for me. So, I ran to the computer and PDFed my file. Then I transferred it to my phone and soon realized there was no easy way for me to zoom in on my document and actually read it. Foiled again. Or maybe not. 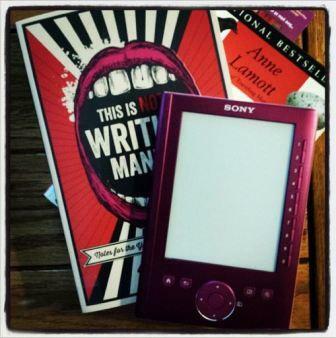 I dug out my old Sony eReader. This eReader is SO old, it confuses me. It’s not touch screen. I keep pressing my finger to the screen waiting for something to happen and, of course, nothing will happen because you have to push actual buttons to make it work. Anyway, this eReader had been gathering dust in a drawer for so long, it was completely dead. I had to wait quite some time for it to charge up enough for me to even turn it on. Eventually I was able to load my file to the eReader and open it. Then something awesome happened. My story opened up on my old eReader, and it was like I was reading a real book. Yes, I know it’s just a first draft, it’s full of holes, and no one else should ever read it as it is. Ever. But what a rush! For a moment, I experienced what it might feel like to open my actual novel on a Kindle or an iPad someday and know that other people are reading it too. How’s that for motivation? Try it next time you get stuck and let me know if you have a similar experience. I have found doing the final edit on an ereader makes it much easier to spot typos etc. Thankfully the ipad also lets me makes notes, as it turns out even on the 5th run through there are still thing to fix! Hurrah on finding your new motivation! An iPad is on my wish list. I have a few writer friends who swear by it. Hopefully Santa will remember me this year! Yea! How fun!! Motivates manifestation! I think I’m going to self-publish a couple of my short stories that I wrote at school and try to motivate myself a bit more. I think it would be cool if a bunch of us got together and published our own collection. Why not? It’s not like we don’t have the experience!